I purchased a lighter duty Shower's Pass jacket and this one at the same time. I love both coats for their design, fit and functionality. My wife likes the built-in lights. Solid gear for rainy commutes. I hesitated at the price but I am completely satisfied with my purchase. This is a solid raincoat with bike friendly visibility, long tail, and vent zippers under the arms. The zippers have allowed me to keep wearing the jacket even as the weather warms up in the spring. 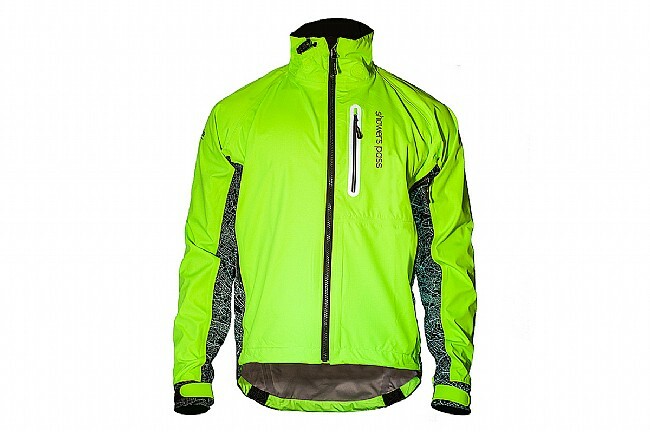 This has become my go to jacket for low light walking and riding conditions. This is a very cool jacket. I live in an urban environmet with not the best street lighting and lots of grey sky days. I wear this jacket any time that it is not really cold for both biking and walking. It is loose enough that you can wear a couple of light layers under it, and it is true to size, but if you are heavy set you may want to order a size up. The green is highly visible in the day, and the side panels really light up at night when hit by street or car lights. 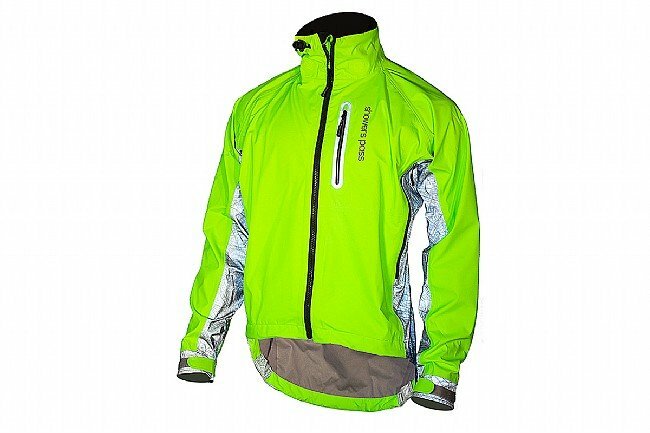 The LED beacon lights I have used on occasion, even when using this as a walking jacket. They give good visibility, and are correctly placed so that they don't affect your night vision. Zippers all work well, and it is waterproof. The only thing I would change is to have an attachable rain hood included. I've happily been wearing this jacket in the late-winterearly spring rain. No problems, good ventilation and (obviously) great visibility from cars! This is one awesome rain jacket !!! I use this jacket on all my winter rides - great in the rain but on these recent freezing mornings it's great when I'm layering up - best rain jacket I've ever owned ! My new go to jacket for riding in temperatures below the mid-thirties. As the temps start rising I start unzipping and loosening the cuffs. The only disappointment is the little lights. They worked in the package but after I squished them into their grommets, they quit working. I even tested the batteries which are still good. I wonder how much of the cost was for those? Wore it for first time yesterday. Temperature was mid thirties and as I warmed up, I just started unzipping zippers and loosening the cuffs. Only problem is all of the lights are defective. When I received the jacket, the lights worked. I squeezed them all into their grommets and hung the jacket up. Yesterday they didnt work and the batteries are OK. I've ridden with this jacket in all appropriate weather. It vents well. Maybe too well in very cold weather. It provides good solid rain protection even in heavy downpours. It's very visible even thought out of the box the lights didn't work. Haven't had time to go get new batteries, assuming that's the problem. I waited an awful long time for the price on this jacket to come down. Im glad I finally could pull the trigger. This jacket is perfection. Cant wait to see how it performs during the winter. The jacket fits well and fits well while in a forward riding position. The long tail works well and the vents provide adequate ventilation for a waterproof jacket. This is definitely not a warm weather rain jacket in my opinion. I ride year around in the Upper Midwest so it is perfect for late fall, winter and early spring snow, rain and wind protection.